Description - Thick and plush, our Malibu Elite Turf Rolls are the cream of the crop when it comes to artificial grass rolls. These fake grass rolls contain three different colored fibers providing you with an ultra-realistic grass look that is second to none. This artificial turf is not only super realistic in appearance and feel, but it is also very durable and is great as pet turf, landscape turf, and even playground turf. Virtually maintenance free, a 15-year warranty backs our Malibu Elite Turf Rolls. Material – Polyethylene and polyproplene fibers with thatch. Face Weight – 85 oz. Weight – .796 Lbs. per square feet. Recommended Uses – Our Malibu Elite Turf Rolls are the perfect indoor/oudoor turf rolls for front and backyards and have been used as turf for pet parks, as playground turf, as pet turf in doggy day cares, and much more. 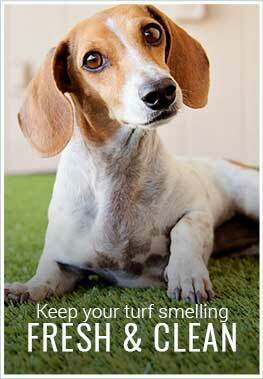 Great as landscape turf, pet turf, playground turf, and much more.